Beautifinous. : Birchbox May 2014 in collaboration with Harper's Bazaar review! Birchbox May 2014 in collaboration with Harper's Bazaar review! 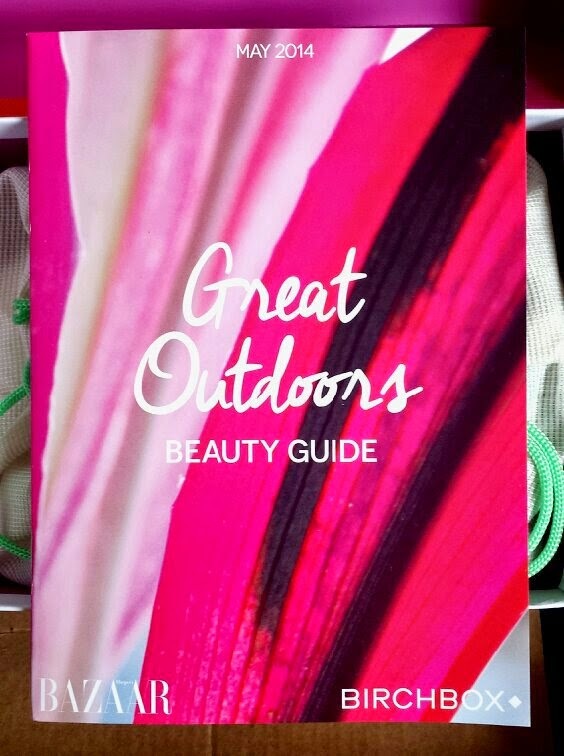 This months Birchbox is in collaboration with Harper's Bazaar and the theme is ‘the great outdoors.’ From garden parties to music festivals, this box aims to provide products for a range of occasions and to inspire you to get out and about. 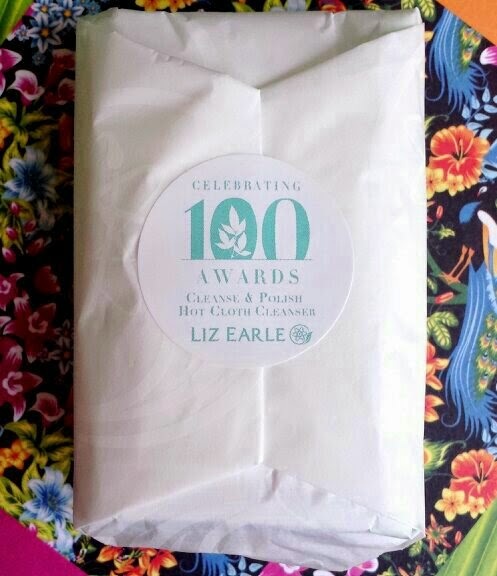 This little cleanser has won 100 awards. 100! That’s a heck of a lot of awards. I was super happy to receive this in my box. I had my eye on two items out of the selection this month and this was one of them (we won’t talk about the other one because I didn’t receive it! *sob*). I haven’t tried this cleanser before (cue gasp! ), but I am a convert now! It was just last month that I sat here in awe at One Love Organics Skin Savior Waterless Balm that arrived in my April Birchbox and now I have another product to awe over. 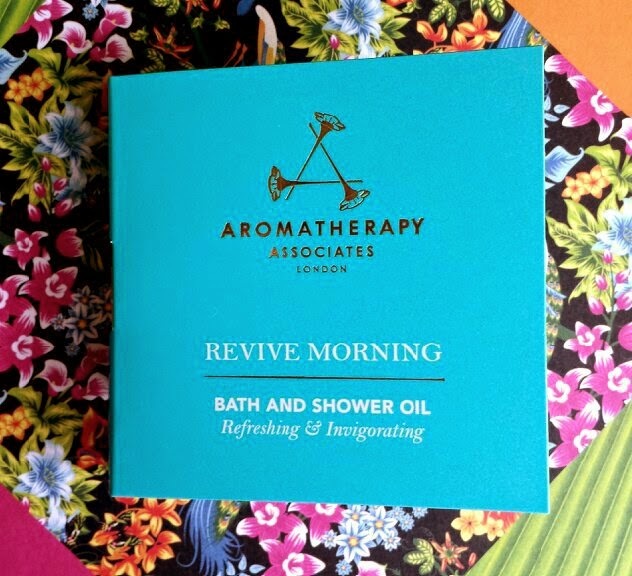 This won't kick OLO's Skin Savior out of my routine, but I will probably be doing some alternating, like OLO in the morning and Liz Earle in the evening. This cleanser is fantastic at removing makeup and I absolutely LOVE the muslin cloth! The cleanser and cloth together leave your skin feeling so soft that it will make you look forward to removing your face at the end of the day. A full size, 100ml bottle costs £13.25 and you can buy it from Birchbox. I absolutely love taking baths, so I was rather excited to test this out in my bath water. The first thing that I noticed when I used it is the amount that it states to use. It says to use a capful of oil in your bath, but when I did this I found it to be too much. The bath was just so oily that I was waterproof and lather proof (even my shampoo wouldn't lather!). Next time I'll be decreasing that amount! Putting that aside, this stuff smells divine! The sample is a bit teeny if you use a capful in your water each time, but now I'm going to be cutting that down I can see this lasting probably a week-2 weeks or so if used every day. I did find that it helped with that morning 'sluggish' feeling too, which is always a bonus! 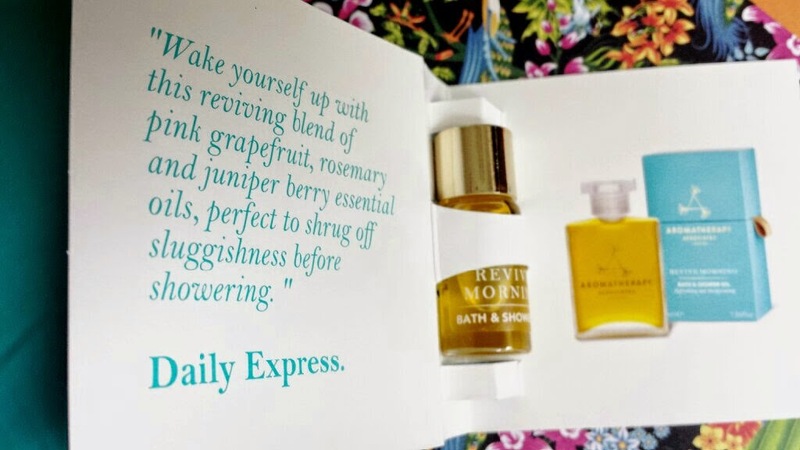 A full size, 55ml bottle costs £39 and you can buy it from Birchbox. The first thing that I noticed about this was the heavy duty packaging. I've never had a nail polish arrive in such packaging before! The box itself was beautiful and screams 'luxury,' (it reminds me of Chanel's Coco Mademoiselle box) and inside the polish was contained in two foam blocks that were squeezed so tightly inside the box that you can be certain that no damage would have occurred to your new bottle. It actually took me a while to remove the foam, but when I did I fell in love with the colour. 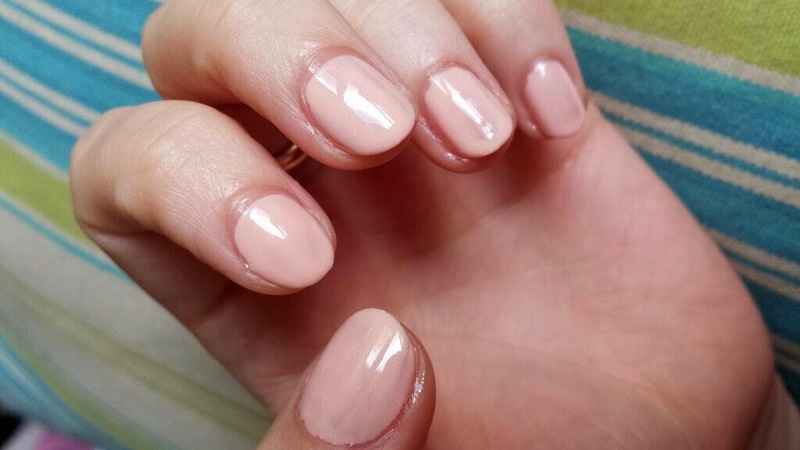 This shade is a pale peachy-beige with a subtle silver glitter. I found the formula of this polish to be a little watery, but this wouldn’t have been much of an issue for me if the brush would have been a little easier to use. I think a flat, tapered brush would work better and make the polish a lot easier to apply as the brush is circular and fat. If you are interested in seeing some similar shades, check out my post about Avon's Gel Finish Nail Enamel in Creme Brulee which is a pale beige. 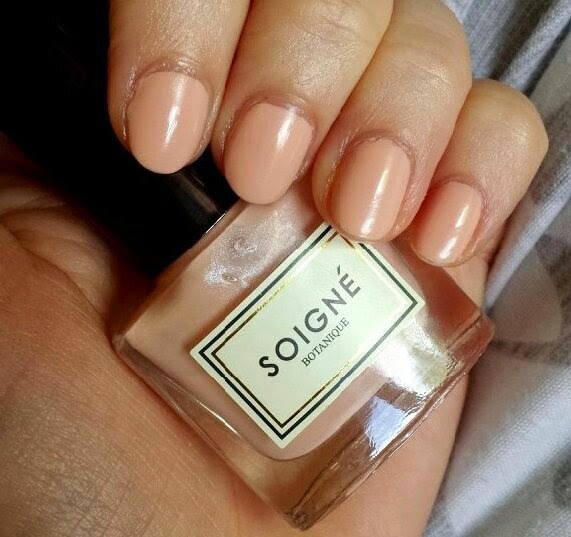 On my post I compared it to a few similar shades so if you like this colour then I definitely recommend that you check that post out. 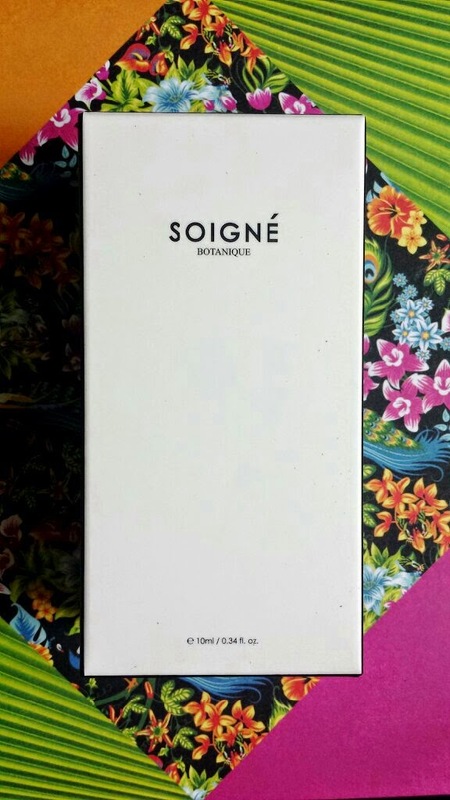 A full size, 10ml bottle (which is the size shown here) costs £11 and you can buy it from Birchbox. Okay okay, cue second gasp, but before receiving this I hadn’t actually gotten around to trying out this mascara. I know, I know! What kind of beauty blogger am I? I honestly have been intending to getting my hands on some but I have been so distracted by my growing love for Dior’s Diorshow Iconic mascara. Anyhow, I tried this item first pretty much straight after opening my box. I was pretty happy with it, but if you have read my post on Diorshow Iconic you will see how I mentioned that ‘tugging’ feeling that I don’t like. This mascara tugged a little on me. Not as much as others that I’ve used, but just a little. That aside, I do like the finish that this mascara gives. It is long lasting and doesn't give your eyes that 'groggy' feeling after a few hours. I hope you understand what I meant by that because I'm re-reading that sentence and wondering if I even understand it myself! Do you ever get that feeling after a few hours of wearing a mascara where your eyelashes just feel a bit... heavy? Like you just want to take it all off again and go to sleep or something. Just me? Well, anyway, I didn't get that feeling with this so that is rather lovely. 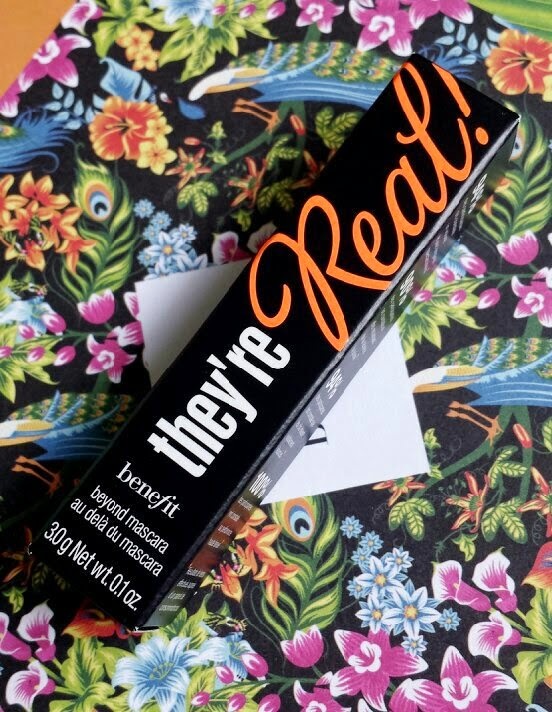 A full size, 8.5g tube of this product costs £19.50 and you can buy it from Birchbox. After receiving the Beauty Protector Protect & Oil in a previous Birchbox, I knew that the first thing that I had to test with these was the smell. If you have smelt the Protect & Oil then you will understand! It is such a sweet, caramelly-candyflossy smell that you just want to gobble up. I am very happy to inform you that these share that smell. IT'S SO GOOD! After using these my hair felt super smooth, happy and shiny. 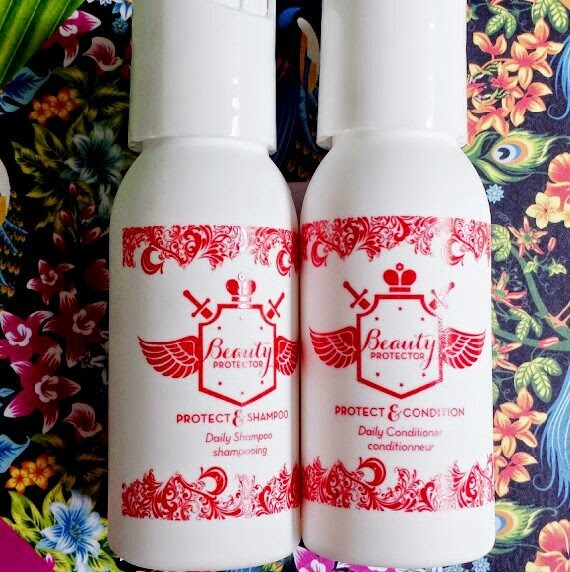 The only issue that I have is the same issue that I had with last months TommyGuns shampoo; I have really thin hair, so if I don't use a volumising shampoo my hair falls super flat. 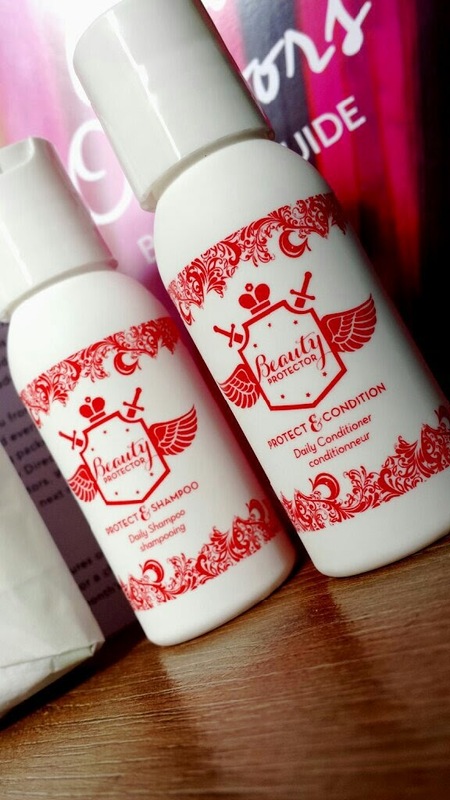 However, I do like this shampoo and conditioner so I will definitely be using them up on days where I just want to detox my hair a bit and forget using my volumising products! 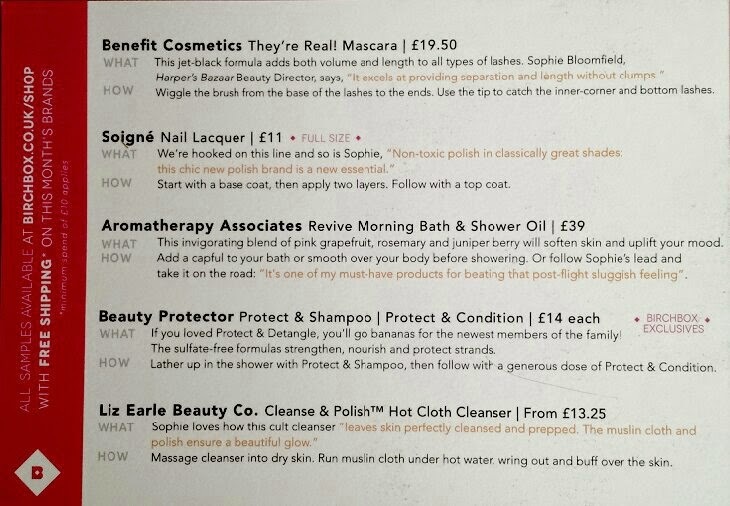 For the full size products it costs £14 for each the shampoo and conditioner and you can buy them from Birchbox. 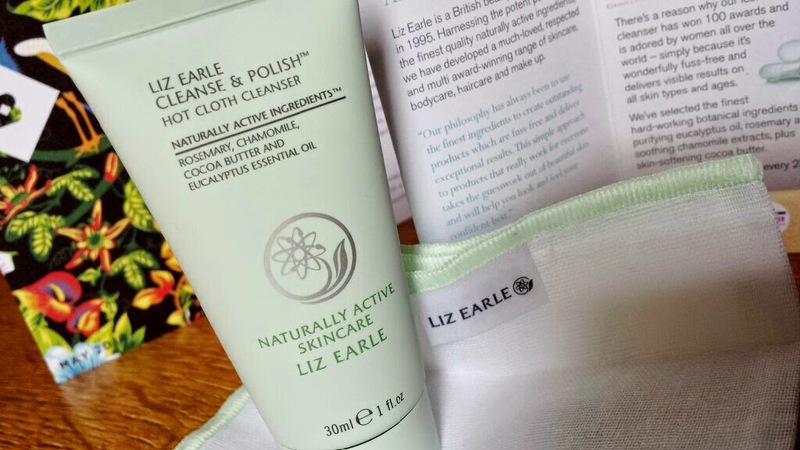 Overall, this month my favourite product is definitely the Liz Earle Cleanse and Polish. I know that I will be getting a lot of use out of that and it's the item that I know I will be purchasing a full size version of. 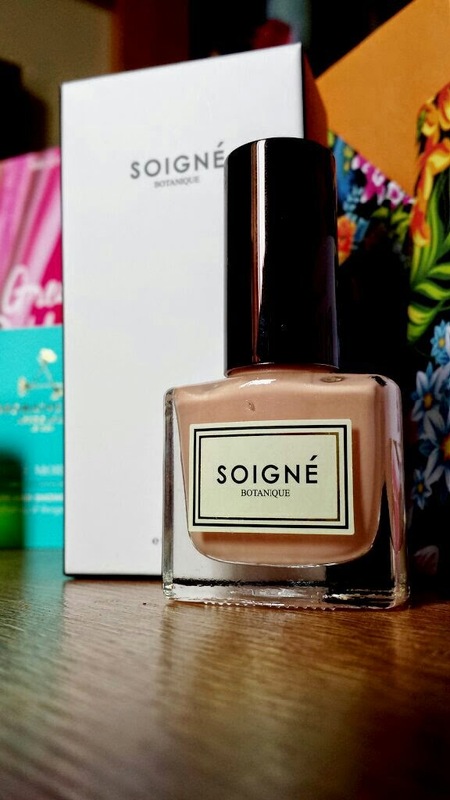 Alongside that, I do really like the Soigne nail varnish and I already have my eye on a couple of their other shades so I will be possibly snapping them up, too. The item that I was a bit sad about not receiving were the supplements. I've been wanting to test some out for a long time but I just haven't gotten around to it. When I saw them as part of this months selection I got a bit hopeful about them, but alas, I didn't receive the sample. I guess I'm just going to have to buy some to test at some point! 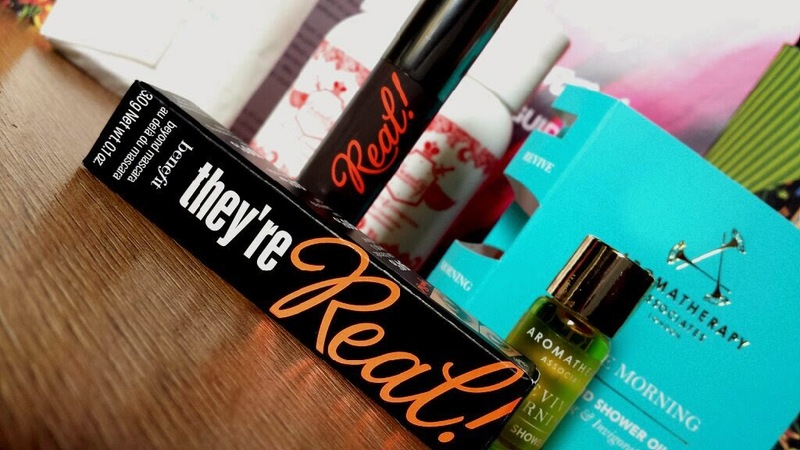 If you are, what did you think of this months box? Have you tried any of these products before? If you liked this post, then please consider nominating me in the Cosmo Blog Awards! Looks like you got an awesome variety of products in this box, thanks for sharing with us. & You are very welcome!